German authorities have arrested an Iraqi national in connection with the bombing of the Borussia Dortmund bus on Tuesday night, which injured one player, Marc Bartra. 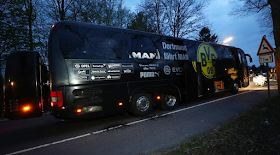 In a statement released by the Federal Prosecutor’s Office (GBA) Thursday, a warrant arrest was issued against a 26-year-old Iraqi national, identified as Abdul Beset A, on suspicion of having links to Islamic State (IS) and connection with the bombing of the bus carrying the Borussia Dortmund football team to a Champions League game against AS Monaco. The GBA’s statement noted investigators have so far produced 'no evidence' of the suspect’s direct involvement in the attack but they strongly suspected that Abdul Beset A. joined IS in late 2014 in Iraq. In March 2015, he was said to have traveled to Turkey and then arrived in Germany at the beginning of 2016, the GBA said. The suspect maintained contact with IS even from inside Germany, it added. The German Prosecutor's office classified the incident as a terrorist attack.